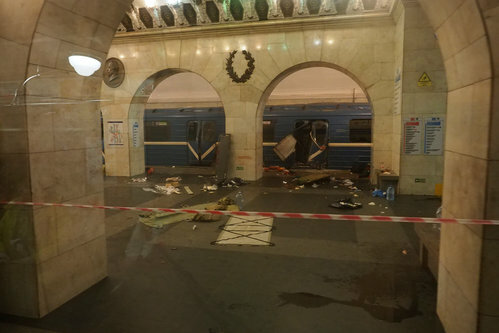 At least nine people were killed and 20 were injured when an explosion tore through a train carriage in a St. Petersburg metro tunnel on Monday, and Interfax news agency said the blast may have been caused by an explosive device hidden in a briefcase. 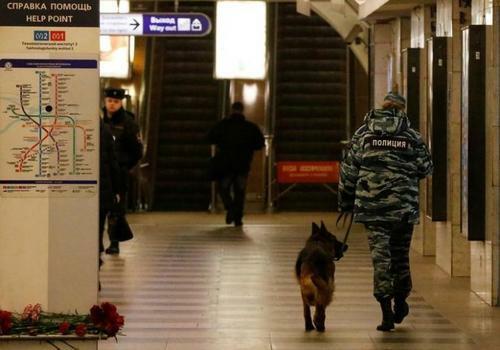 Russia has issued search warrants for two people for their possible role in Monday's deadly metro blast in St Petersburg, Interfax quoted a security source as saying. Mourners pay respects after multiple people were killed when an explosion tore through a train carriage in the St.Petersburg metro system, the Russian National Anti-Terrorist Committee said. A blast in a St Petersburg train carriage on Monday that killed 11 people and injured 45 was carried out by a suspected suicide bomber with ties to radical Islamists, Russia's Interfax news agency cited a law enforcement source as saying. Witnesses said they saw passengers who were bloodied and burned spilling out of the train, whose door was buckled by the force of the explosion, and lying on a platform while smoke filled the station. Russia has in the past experienced bomb attacks carried out by Islamist rebels from Russia's North Caucasus region. The rebellion there has been largely crushed, but Russia's military intervention in Syria has now made it a potential target for Islamic State attacks, security experts say. Earlier, Russian media had broadcast closed circuit television footage of a bearded man they said was being sought by police as a suspect. But Interfax reported that the man had come forward and been eliminated from inquiries. The news agency, quoting an unnamed law enforcement source, said that human remains examined at the scene suggested that the blast had been carried out by a suicide bomber. It said the police had identified a suspect with links to radical Islamist groups banned in Russia. U.S. President Donald Trump spoke with Russian President Vladimir Putin on Monday to offer condolences to the victims of a bomb blast on a St. Petersburg train that killed 11 people and injured 45, the White House said in a statement. The likely suspect in a deadly blast in the Russian city of St. Petersburg is a Kyrgyz-born Russian citizen, Kyrgyzstan's security service said on Tuesday. Reuters UKA blast in a St Petersburg train carriage on Monday that killed 11 people and wounded 45 was probably carried out by a Russian citizen born in Kyrgyzstan, authorities from the predominantly Muslim central Asian state said on Tuesday. The death toll from the bomb blast in St Petersburg has risen to 14, Russian agency RIA Novosti quoted the country's health minister Veronika Skvortsova as saying on Tuesday. The blast which happened on a metro train has also injured almost 50 people. The death toll had stood at 11 people on Monday. Kremlin spokesman says any terrorist attack is a challenge for every Russian including the President. Kremlin spokesman says the fact that Putin was in St. Petersburg at the time of the attack is noteworthy. Russian Investigative Committee says won't disclose bomber's details for now - Interfax. 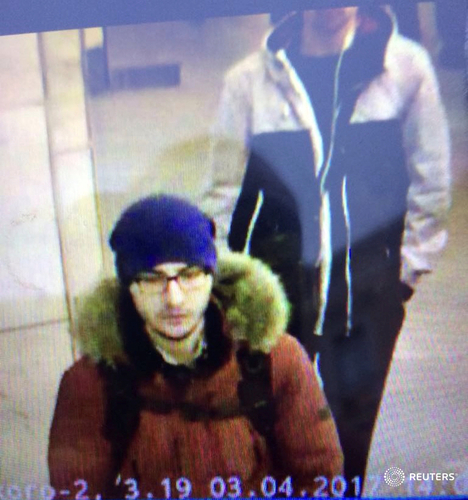 Russian investigation committee identifies Akbarzhon Jalilov as the bomber behind St. Petersburg metro blast - statement. Jalilov left a bag with an explosive device at Ploshchad Vosstaniya metro station - Russian investigation committee. Memorial event held in Moscow to commemorate St Petersburg metro blast victims. 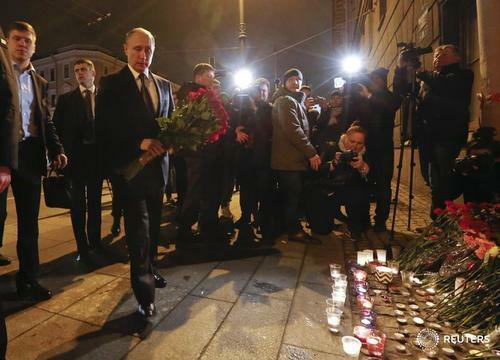 Reuters UKRussian authorities detained several people in St Petersburg on Thursday after finding an explosive device in one residential building and said they were investigating suspected accomplices of the man behind this week's deadly metro bombing. Explosives found in a residential building in St Petersburg are similar to the unexploded bomb in the city's metro, found on the day of the bombing that killed 14 people on Monday, Russian security sources said on Thursday. "Explosives were in a similar amount that was used at Vosstaniya (metro station)," a security source told Reuters. A Reuters witness near the searched building heard officials discussing that the explosive device "was exactly like" the unexploded bomb. No one hurt in St. Petersburg residential property explosion - RIA cites emergencies ministry. A loud explosion was heard on Thursday in a residential building close to the site in St Petersburg where explosives were found earlier in the day, Reuters witnesses said. No one was hurt in the explosion but a vehicle was damaged by falling masonry, news agency RIA said, citing a source in Russia's emergencies ministry. 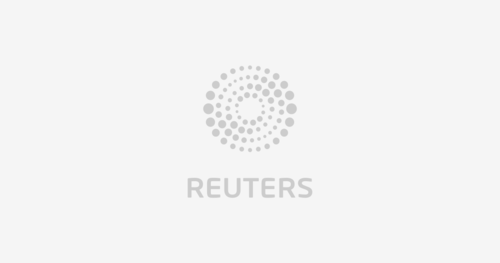 ST PETERSBURG, April 6 (Reuters) - A loud explosion was heard on Thursday in a residential building close to the site in St Petersburg where explosives were found earlier in the day, Reuters witnesses said.